← It comes from deep within me. It’s been two months since my last post here at Wallypots.com, and I’ve got a ton of new items to show you! 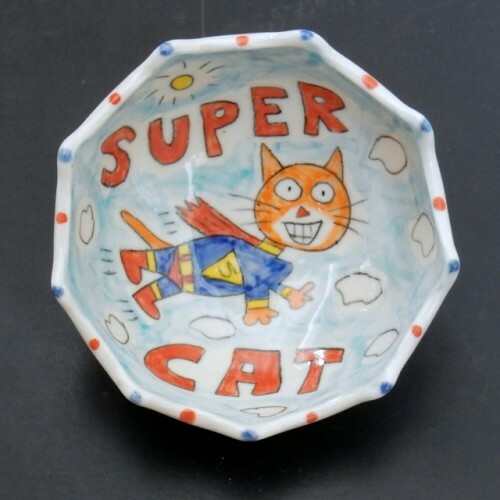 Fresh out of the kiln this week is my latest cat bowl: “Super Cat”. 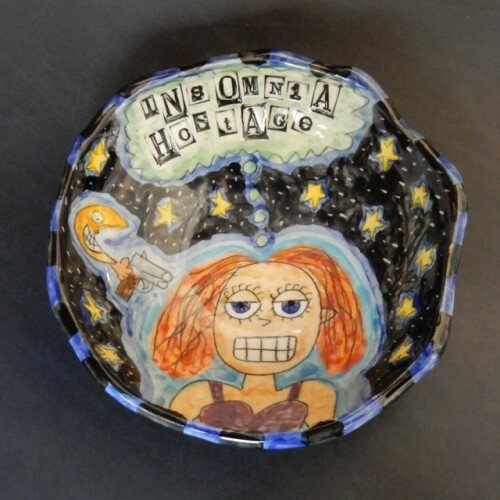 It measures five inches in diameter by two inches deep and sells for $26.00. 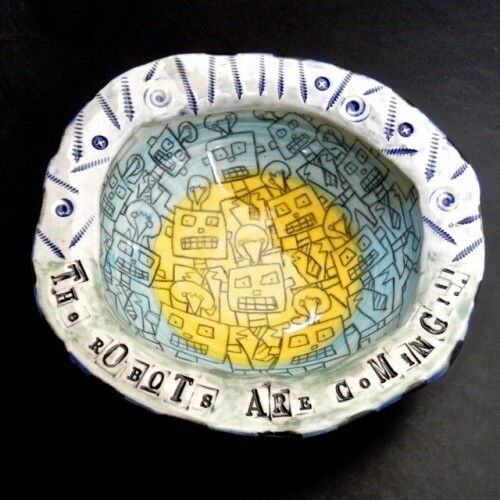 You can find it in the “BOWLS” section of my online store. Here’s a true runaway best selling design. 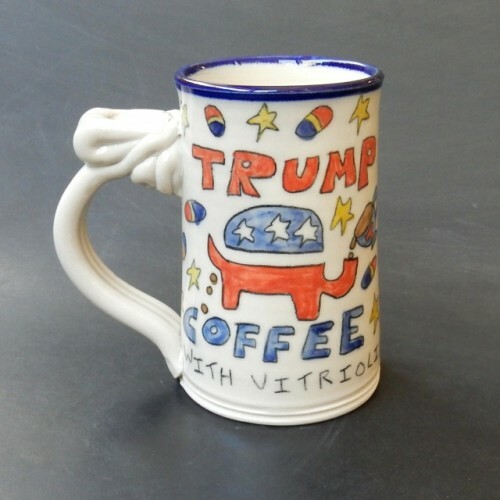 The wording says, “TRUMP COFFEE with Vitriolin. WARNING! Side effects may include: explosive narcissism, orange skin, lying, misogyny, chronic bad hair, sleazy business deals, racism and more.” When the first sixteen of these came out of the kiln three weeks ago, they sold within days via Facebook and a few select wholesale accounts. 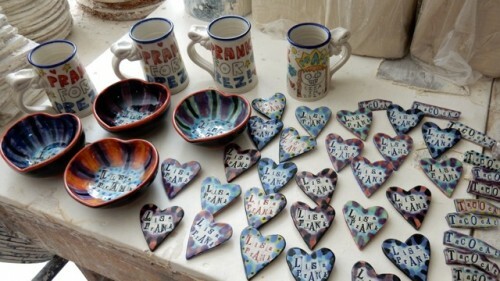 We had 32 of them on backorder and the second firing contained over 60 of them. 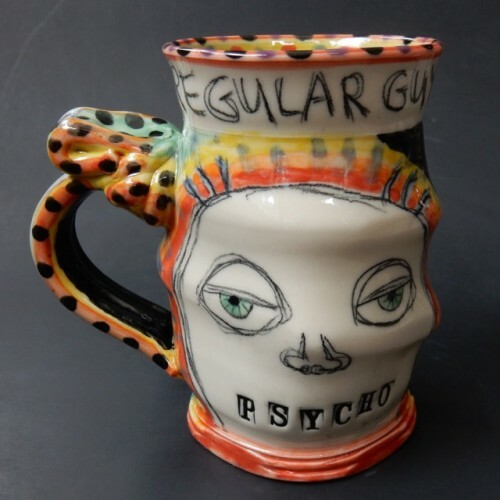 As of today, I have just twelve left so if you want one ASAP, get on over to the “MUGS” section of my online store! 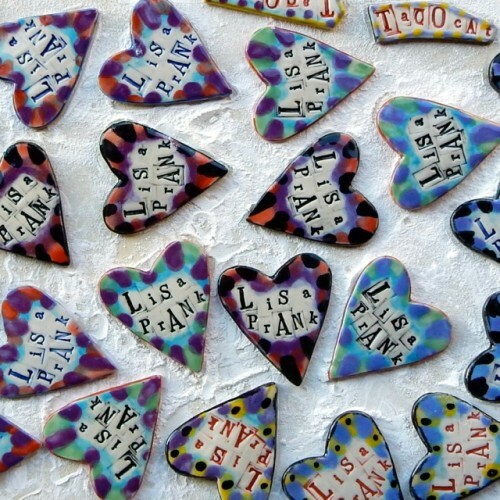 The past two firings have yielded dozens of great new one of a kind art pieces. I’m really enjoying exploring new design ideas and I think these are some of the best pots I’ve made in a long time. 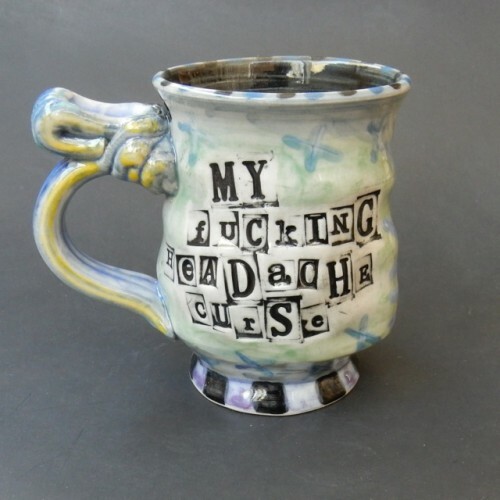 These mugs and bowls were made with a selection of varied alphabet rubber stamps and I call them the “Ransom Note Series.” You can see more of these in the new “ART POTS” section of this site. Most of them are still for sale, and you can see what’s available in the “ONE OF A KIND ART POTS” section of my online store. “What the heck are these?!! !”, you might ask. Well, this was a really fun project I did last week for my daughter, Robin who is a singer/songwriter in Seattle, WA. 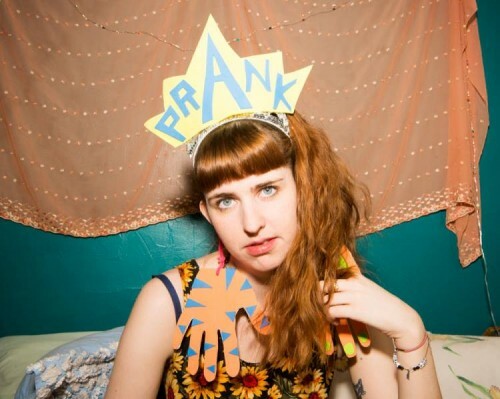 These days she goes by the stage name Lisa Prank and she’s got an album coming out in June. “Starting Again”, the first single off the album has gotten great reviews from Stereogum, Spin Magazine and a host of others. It’s pretty darn exciting! She’s got a tour coming up next week that takes her all the way across the United States traveling with her friends and rising stars, Tacocat. So being the doting dad I’ve always been, I decided to get in on the fun and make some high-quality band merchandise for her to sell alongside her t-shirts and stuff. These pins were made with good old cookie cutter technology and I’m really thrilled with how they turned out. I also did some mugs and bowls, which you can see here in this hastily shot pic I took on my arduous shipping day last Monday. It’s so fun to have a fellow artist in the family! This entry was posted in Family, New items. Bookmark the permalink.